The demand for refining internal governance and management system. The need to align ECFE with newly emerging external developments locally as well as globally. To match the working modalities of ECFE with new developments, methodologies and approaches for efficient service delivery. 1. Establishment of Task Force: Following the decision by the General Assembly in February 2006 to develop a 10 year strategic direction for the period between 2007 and 2016, the ECFE Board took the overall responsibility of guiding and coordinating the whole process. They established a Task Force to work on the technical details, with members from the Board, denominations, Secretariat and individuals. The Task Force identified IIRR to facilitate the strategic process. The process was facilitated by Dr. Isaac Bekalo, Regional Director of IIRR in Nairobi, Kenya. 2. 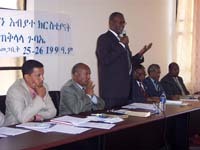 Orientation on Strategy Development: The first step in the development of the strategic direction is the organization and delivery of orientation from 18 to 19 July, 2006 on the basics of developing a strategic direction to the Task Force and other key members to be involved in the process. Discover: Assessment of history, past performance with appreciative and critical assessment of the internal and external environment. Dream: A visioning exercise towards the development of vision, mission, and core values. Design: This stage goes into the detailed development of the different systems such as governance, financial, human and others. Deliver: This entails development of the detailed operational plan and annual budget for all activities of implementing the plan. The above was achieved using the following specific methods. 4. Conduct of Survey and Synthesis of the Outputs: Questionnaires aimed at soliciting ideas and opinions as regards to the current ECFE operations, Strengths, limitations, opportunities and threats (SLOTs), and suggestions for future values, missions and strategic program areas were designed, checked and duplicated. They were sent to 22 member denominations, 35 associate members, 15 easily accessible zones, ECFE staff, Board members, various commissions and churches in Diaspora. The Task Force produced a report of the results of the survey. To ensure all relevant stakeholders have had a say in the strategic direction, the Task Force also used the ECFE staff retreat held in Awassa from 13 to 15 December 2006 to gather further inputs to the SP. 5. Focus group Discussions: The determination to have input from every direction using different approaches included organization of a 3-days focus group discussion workshop from 19 up to 21 September 2006, with relevant participants (key informants) representing all stakeholders. The results of the SLOTs exercise were used to come up with recommendations regarding what strategic issues have surfaced in ECFE operations and what strategic options are available for its future. 6. Development of Strategic Elements: Using all the above inputs from all directions and using different approaches, the Task Force finally organized a workshop in February 2007, facilitated by Dr. Issac Bekalo from IIRR, to develop the most fundamental elements of the 5 year strategic direction of ECFE: Vision, Mission, Core values and strategic goals. The workshop participants were ECFE Board Members since this is the most strategic part of the plan indicating the future of the Fellowship. The workshop also agreed on the process towards the write-up, sharing, commenting and finalization of the draft strategic direction. 7. Finalization of the Strategic direction: Once all elements of the strategic direction are gathered in draft form, the write-up was done and shared with all relevant institutions and individuals, a meeting of the Board and heads of denominations made final comments, which was later on included in the development of the final draft. The draft was then presented to, discussed and approved by the General Assembly of ECFE on 2 April 2007.